Samford University's Beeson Divinity School has 23 new alumni following commencement exercises Wednesday, Dec. 5. Graduates included 16 Master of Divinity degree recipients and 7 Doctor of Ministry degree recipients from eight states. M.Div. graduate Nathan Carroll of Oneonta, Ala., became a second-generation Beeson alumnus-with a repeated distinction. 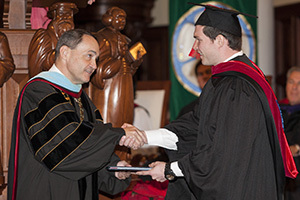 Alphabetically, he was the first in line to receive his diploma, as was his dad, Steve "Ernie" Carroll, when he became the first-ever Beeson graduate in 1990. The elder Carroll was one of the first three students to enroll when Beeson opened its doors in 1988, an event the then one-year-old Nathan doesn't recall. "I wanted a master of divinity degree so that I could become a chaplain in the National Guard," explained Ernie Carroll, who already held a master's degree in religious education from another seminary. His subsequent 14-year tenure in the Army National Guard included deployments in Baghdad in 2004 and 2005. A veteran of 32 years as an Alabama Baptist Director of Missions, he is currently D.O.M. of the Friendship Association in Blount County. Nathan's new Beeson diploma will hang beside his Samford bachelor's degree sheepskin that he earned as a geography major in 2009. The Carroll family, including wife and mother Renay, joined proud friends and relatives of other graduates at the commencement program in Andrew Gerow Hodges Chapel. Birmingham's Cathedral Church of the Advent Dean Frank F. Limehouse III was guest speaker. Rev. Limehouse advised the graduates to beware of seeking great things only for the sake of greatness for themselves. Jesus Christ, he reminded them, has already done that for them. "There is nothing greater than becoming a Child of God, which you are," he said. Limehouse based his remarks on Jeremiah chapter 45, verse 5, which reads: "Seek thou great things for thyself? Seek them not." The Lord's prohibition is not against preparation, hard work and using the talents given by God, said Limehouse, but the operative word is "thyself." Misplaced ambition, although it may be a socially acceptable sin, is nevertheless a sin. "It's a bad side of human nature," he said, as is envy. If selfish ambition at any level is a struggle to justify oneself, he cautioned, one can never do enough to quench the thirst for great things or glory. "There is always more to be done; always a higher plateau," he said, recalling famed baseball pitcher Nolan Ryan's observation that "You're only as good as the last game you pitched." Dean Limehouse was called to the Birmingham church in 2005. Previously, he was rector of St. Helena's Episcopal Church in Beaufort, S.C., and St. Bartholomew's Episcopal Church in Hartsville, S.C. The South Carolina native holds degrees from Wofford College and Virginia Theological Seminary. The commencement program included the traditional prayer of consecration and blessing of each student in which Beeson faculty members pray individually for each student. This time of consecration, Beeson founding dean Dr. Timothy George pointed out, underscores the divinity school's dual role as an academic institution that sends forth its graduates to serve in the Lord's work. Along with their diplomas, each graduate received a copy of the Holy Scriptures. Continuing a tradition begun several years ago, the most recent Beeson graduates contributed to a fund that will help provide Bibles to an Unreached People Group in another part of the world.